Do you know how to create a good resume or CV The Last 5 Resume-Building Apps and Sites You'll Ever Need The Last 5 Resume-Building Apps and Sites You'll Ever Need Use these fantastic resume building sites and apps when you need to make your CV stand out in the crowd. With the right tools, you can build a unique resume quickly even without design skills. Read More ? All too often, tips focus on the thing you should have on your resume, but how often do you see good advice on the things to leave off? That’s just what we’re here to share with you today! 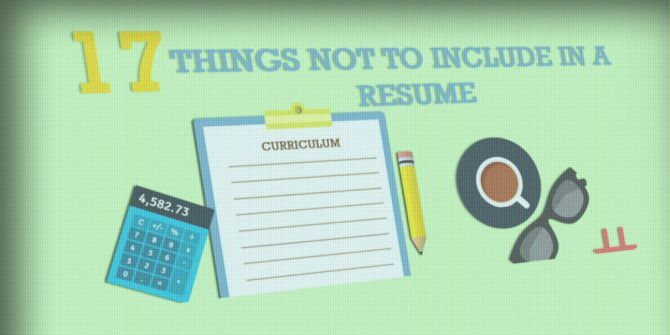 The infographic below features 17 key things you should avoid on your resume. Landing the job of your dreams 5 New Tools to Snag the Job of Your Dreams 5 New Tools to Snag the Job of Your Dreams The web is where you go to when searching for a new job or reinventing a new career. A clutch of fresh new digital services are changing the way we go about our job hunt. Read More is all about impressing potential employers with the things they need to know, and not wasting their time with things that are irrelevant to them. Explore more about: Infographic, Job Searching. Points 2-4 are also completely invalid for an acting or other performing arts resume. I Like LINKEDIN The Most, And I Have Provided Most Of The Information They Have Requested From Me. According To You, They Have Requested A Couple Of Irrelevant Points.